Mensusa https://www.mensusa.com/articles/a-velvet-bow-tie-adds-sophistication-to-your-personality.html A Velvet Bow Tie Adds Sophistication To Your Personality It is a matter of style and preference how you adorn your boy from an early age. The parentsâ€™ sense of style is naturally followed by the children as they grow up. So it is important that you take care to buy great suits like the boys grey suits or boys tan suits with matching velvet bow tie to make him look outstanding and smart. Suits are the staple attire of men around the world. All men require suits of various kinds to attend different events during their lifetime. But wearing only exclusive suits gets boring and so stylish men choose designer ties to add a fresh look to their regular suits. A velvet bow tie is a good choice when you want to look smart and elegant. Velvet is a smooth fabric and has a decent look because of the shine. It helps to enhance your appearance on all occasions. 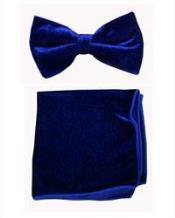 Visit MensUSA for different shades of velvet bow tie to match with your suits. Today young boys are more style conscious than youngsters of early days. They like to dress up in the trendiest clothes and most often follow their dad's footsteps. Taking into account these facts, designers offer a variety of suits of different styles and cuts and indeed innumerable colors. When your boy has to attend a sober function, let him wear the boys gray suits. This shade has a dignity of its own that offers a sophisticated and smart look to the wearer. MensUSA spreads out an array of boys gray suits for all ages and sizes. Pick out the fit that suits your boys well and make him look like a complete young man. A young boy in a well fitted suit naturally looks smart and handsome. To add to his personality, pick out the boys pinstripe suit from MensUSA. You will find an amazing range of boys pinstripe suit of different cuts and fit like the single-breasted, double-breasted and the slim fits. For a formal occasion, it is meet that you go for the appropriate colors and best fitted suit in order to look outstanding and dignified. As it is, a pinstripe suit has its own style and air that makes the wearer look smarter. 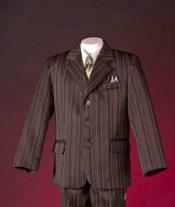 You can choose from the blue pinstripe suits or the black or gray pinstripe suits to match your skin tone. Apart from the boys pinstripe suit, you will get matching accessories like the dress shirts, ties, belts, etc., at MensUSA. There are innumerable suit colors that are bright and gay. Each shade has its own expression and if you are planning to make your boy look like a prince, your best option is the boys purple suit. The shade is unique and has a royal touch that makes the wearer become the center of attraction at every gathering. There are different shades of boys purple suit and so you can select the one that appeals to you the most. 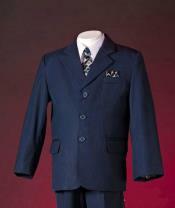 MensUSA offers boys purple suit of different sizes, cuts and designs. Pick out the appropriate one and flaunt your style. When the occasion is a serious one, it is right to dress up accordingly. Look for the boys tan suits at MensUSA when your boy is attending his school or college prize distribution day. He must look smart, sophisticated and stylish too and so the ideal choice is the boys tan suits.